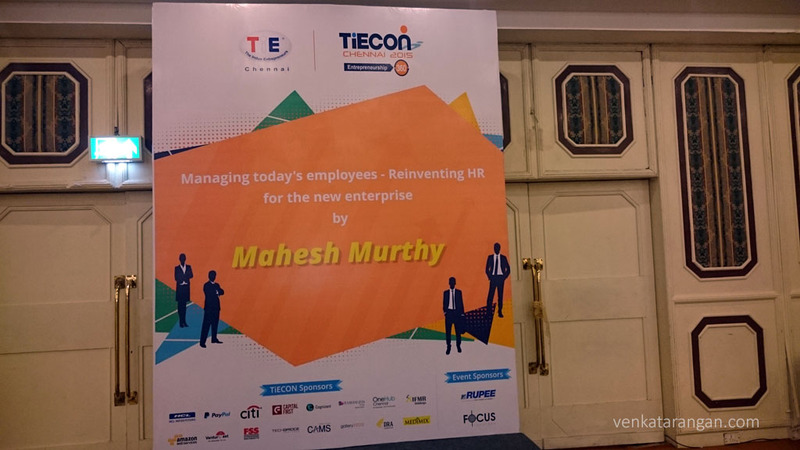 TiE Chennai as part of TiECON 2015 curtain raiser had organised an event today in Crowne Plaza, titled “Managing today’s employees – Reinventing HR for the new enterprise” by Mahesh Murthy. Mahesh is a legendary investor, Founding Partner of Seedfund and Founder of Pinstorm. 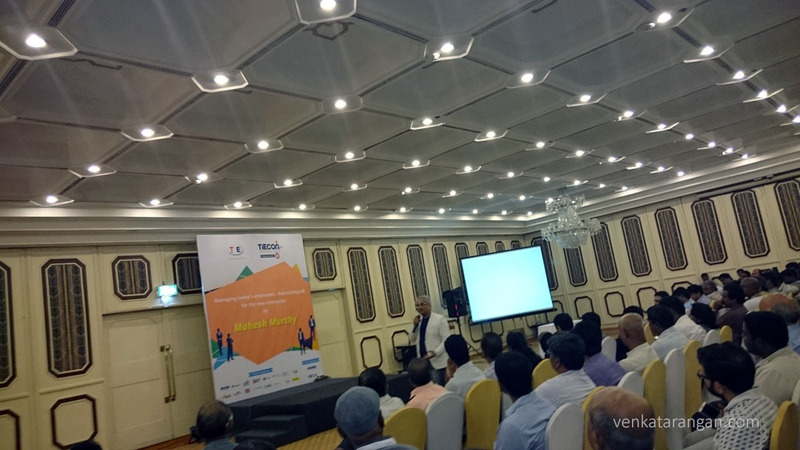 If you thought a HR talk can be anything but fun, Mahesh’s talk today proved it wrong. He shook up the audience with his sense of humour, wit and all through out his vast experience helping numerous companies to scale was evident. 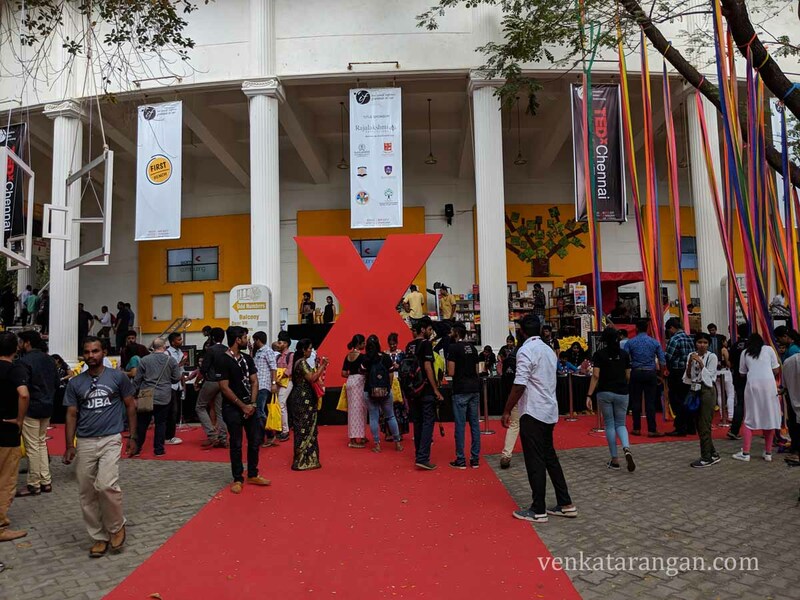 Thanks TiE Chennai for an evening that was well spent. 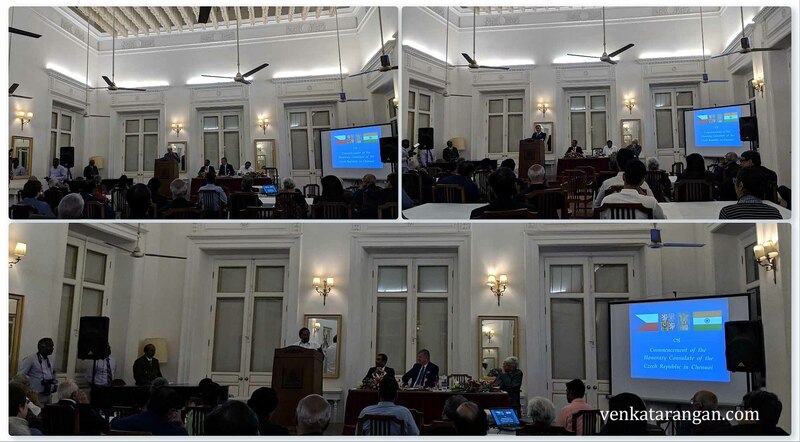 Below is my notes from the event in the order in which it was delivered by Mahesh, mostly unedited and raw as it was delivered by the speaker. The true HR of a company is the CEO. I fund you (CEO) to write the HR policy of your company yourself, If you are going to get someone else to do it, he/she will write the way they want and create a company they want and not what you want. As a CEO you started this company because you didn’t want to work in a regimented way. In many of the companies we funded a commonality we found is they all wanted similar type people. I want to hire people who can have significant way with ambiguity, if I simply ask him a proposal without saying anything more – can she do it on her own, decide on which stationary to choose, and do it all without I needing to edit a single line. There is absolutely not enough information we have here but we want you to answer. Even the receptionist should be able to handle ambiguity. I want people who can use both left and right brain. I go to Bachelor Science colleges and not flashy Engineering or MBA universities. I want to hire them before they do a MBA and convince them to join now, instead of doing a MBA and then joining. This way I will be able to pay less, rather than wait for them to finish a MBA and pay them three times, then do the same job. Eventually the resources will be able to earn the same in few years. For lazy HR’s easiest is to hire a IIT Madras graduate with a IIMA Post graduation, but see what those do, they all end up working in bank. In India we don’t have an educating system, what we have is a filtering system. A strategic HR instead will design around Whats the type of Company we are, where we want to go and align with CEO on the vision. In one of my invested companies, the HR came and pitched for differential salary for MBA graduates vs others in the company. 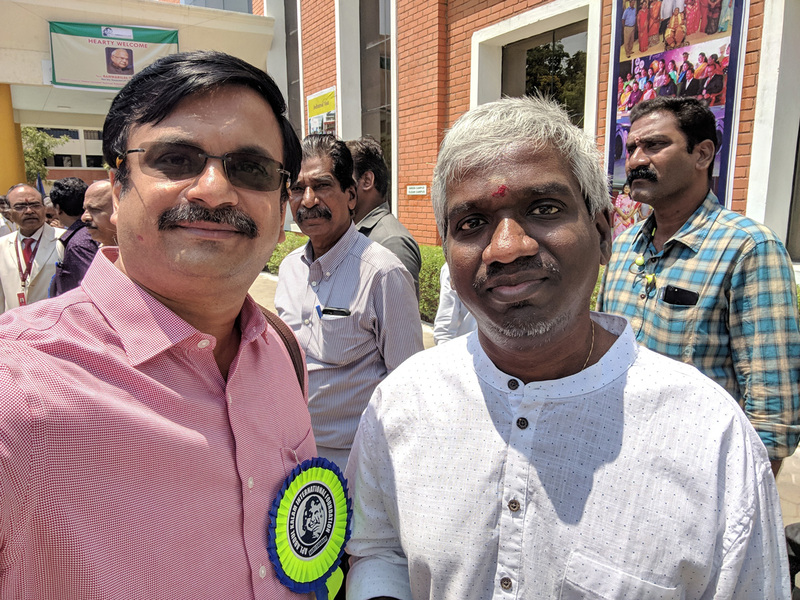 I immediately agreed and asked her to pay 20% Lessor to the MBA’s as I have spend 3 to 6 months detoxing them on the rigidity they learned in MBA. If I myself is a 12th graduate and I am owning the company, how can I expect my people to be even graduates. Typically a HR function comes in to a company when it reaches 20-25 people mark. Next change comes when the company grows from 26 to 81 people. At this stage you start hiring managers. These person have huge issues managing people who used to be your equal without feeling bad, they need training at this place on how to handle their team in an effective manner. When the company grows to 300 People the next change comes in. HR in a company should be hassle free. We all know that every one in a company share their salary details with everyone else, there is no point in keeping it secret. First thing this generation says is I am Magesh, I make 6.5 lakhs. Our generation didn’t do this. Then how to make a salary structure that’s transparent that works for this generation. You have salary grades and make it transparent. We made a nine overlapping salary bands. Everybody goes through a self grading with their supervisor agreeing with your score. You put your grade, the Excel sheet spits out the salary from your band. We made the sheet open source. Salary conversations stopped. For large companies like Google salary information are available in Quora, then what’s the point in keeping it confidential. If the company itself is not doing well, then how can you do better?. If the company is doing 3.0, you can’t do 4.5. The CEO can still do moderation for a department if they over appraised themselves. Swiping card is not something I like. If you are anywhere near office, you have a smartphone and have logged into to any of the Social Apps (FaceBook or LinkedIn) then you are in the office for me. In case of Netflix you can take leave up to one year without any approval, if you need leave for a period of more than one year you need approval. The current generation’s conversation is like this, who has the better chef, the better food whether it is Google or it is Facebook. It’s cruel to demand that to do eight hours work, you need to spend twelve hours a day including commute in major cities. Bring your own device and Work from Home, are all great ideas, we should embrace it and may be even save money in providing space and laptops. United airlines allows you to use your own smartphone, your own headphone with wireless access to their content while you inside the cabin. You don’t force people to come all days, allow them to work from wherever they want to. Make office a fun place, make it a coffee shop like environment. You don’t need full time staff too in many cases. One huge bone of contention is always around designations. In many cases client will rank on the designations they see on your business card, why should they be allowed to do that. In one company I banned all external display of rankings. We had a great system of internal levels, that’s enough. It also helped that when they wanted to switch companies, market had trouble placing them. I also took out all the cabins in the company. One person who gets the biggest table be the receptionist. Everybody gets addressed only on first name basis. Title or age for me is not a sign of wisdom. I want my firm to be the most attractive than every other firm to attract the best talent. One sign of hiring the right candidates is to call the potential hires and offer them less than what they are getting. If you are the HR what’s the fun in hiring if you are allowed to pay more and get hires. Of course, you give the joining employees other incentives to compensate. You need people to join your firm for the right reasons. In one company we even announced on our website we pay less than market by 10%. I tell my HR to go to conferences and look for people who spoke sense, I want those people to work for me. A HR person has to be a spy. In one instance we developed tools for HR person to see consolidation of all updates from their people’s Facebook &Linked-In pages, after all these are Public information and you can pre-emptively react to their dissatisfaction. What’s the point in reacting after they put their paper. I never negotiate on salary terms after a resignation. In one firm the CEO got insurance for parents of all the employees, it tremendously reduced attrition andhe just spend Rs.300/ employee per month. The insurance were ready made product from Insurance firms with no questions asked, even for a 80 year cancer parent. The minute you have staff welfare planned on a routine schedule it’s not staff welfare anymore. It has to be spontaneous. Instead the CEO has to say take out people surprisingly for a drink for no reason. Learning and educating: In firms instead of rewarding regular graduations/degrees, we say to people,you do any course you want, do it online and earn a certificate, we will pay you for it. Genuinely they will, because it’s what they chosen. Even if its not your area of work, you can do it. In coursera like online course you get world class education for just $100. In another firm we made a roaster of when each will be teaching their peers every three months once. For that first you need to learn, master the subject as you need to reach it to your peers and even to your superiors. The kick Junior team members will get of teaching their bosses boss is awesome. The role of HR is multi-fold. In one company we had everyone at each level gets paid the same. We took out the apartheid out of Sales guys getting paid the most, followed by technical team, with the lowest for Admin, HR and Finance.This took out the looking down of support staff by sales and improved cooperation. Who should run HR?. In my view it should be people like me who haven’t studied HR. HR is the most important function and that’s why you shouldn’t leave it to a HR person, the most talented people should run HR and in most companies it will be the CEO or someone senior enough. Most of natural attrition is good for a company. Integrity is super important for me, a CEO stealing money has to be sent out immediately, some VC firms don’t have the stomach for it, but it is of no doubt to me. Finally when I interview people I ask non-interesting questions, to find out really what they did. Some years a friend of mine taught me BEI (Behavioral Event Interviewing) and I use it most often, I train CEOs on how to interview. For me, your lateral skills are more important and your linear skills are less important. In one test we showed a photo of two kids inside a blanket, we asked what happened why are they inside it. There is no right answer for it, but we want to hear what happened from them.